On the 25th September 2015, over 200 nations gathered in New York at the United Nations to launch the Sustainable Development Goals (SDGs). These new 17 Goals build on the previous 8 Millennium Development Goals (MDGs). The outcomes of the MDGs were a combination of encouraging successes (poverty reduction and access to clean safe water dramatically improved) and a number of missed targets. 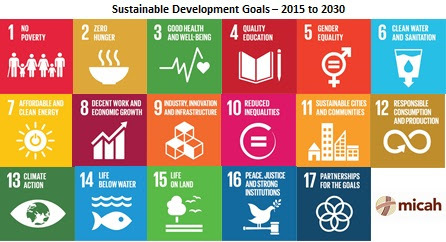 The ambitious 17 Goals now set in the SDGs, with their 169 targets can initially feel overwhelming. There are risks and hurdles in each commitment, but there are also inspirational opportunities for us to unite behind a common vision and framework to advocate for our governments to implement these commitments. Micah Global’s vision of seeing communities living life in all its fullness, free from poverty, injustice and conflict, wholeheartedly embraces the SDGs as an important framework to strive for the common good for all – leaving no one behind. 6) Sustainable development: encouraging fair economic productivity within ecologically sound frameworks with a commitment towards renewable energy sources. Leaders at all levels who steal resources given for the common good of all are thieves. Corruption, injustice, violence, poor governance and greed are major hurdles to be faced if we are to fulfil the SDGs together. We cannot address the 17 Goals without raising awareness of the travesty of selfish, power hungry and corrupt leaders, unjust policies and laws, biased media and propaganda, and prejudiced actions. The Micah Call to Action encourages us to unite behind our shared vision, drawing on the Biblical mandate issued by our God of Justice, and working with the Global SDGs to see that no one is left behind. We congratulate the UN and all who took part in the development of the SDGs and we join in the commitment to see these Goals realised.